● Heavily-armed police breaking down the door is getting all the attention, but what happened afterwards is worse – because what happened afterwards happens all the time. ● The children were thrown into separate foster homes – and kept there, in part, because of an incident in which the father behaved like the executive editor of The New York Times. UPDATE. APRIL 22: Now the judge mentioned in the update below has let reporters back in - but effectively imposed a gag order on everyone. That shows you the Arizona Department of Child Safety knows how badly it screwed up in this case - and how desperate they are that people not find out about it. The best way to fight such gag orders is to make them backfire - by spreading the word about what we already know about this case. UPDATE, APRIL 15: Perhaps we all should have known this would happen. A lot of the excellent reporting on this story was made possible by the fact that the early court hearings were open to the press and the public. But last week, a different judge kicked out the Arizona Republic reporter who has been writing about the case. Details here. But though it’s the video that’s getting the case national attention, what happened after the police broke down the door is even worse. That’s partly because, while sending in what certainly looks like an actual SWAT team is very rare, everything else done to the children in this case is standard operating procedure. It’s because of the standard operating procedure that even now, more than a month later, all three children remain trapped in foster care. The children’s suffering was exacerbated by a child protective services agency apparently out to wreak vengeance on the parents for daring to tell their story to the media – and that, too, is common. But even without that extra bit of cruelty, the case reveals how children are harmed by the routine way the system functions in thousands of cases every year. All of this is why it’s so important to study this case, which we can do thanks to excellent reporting by Dianna Nanez of the Arizona Republic, and because in Arizona court hearings in child welfare cases are open. 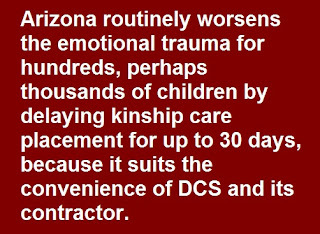 In this case the hearing stayed open despite the desperate efforts of Arizona’s Department of Child Safety (DCS) to close it. On February 25, Sarah Beck took her two-year-old to the doctor. So let’s stop right here. No one forced Ms. Beck to do this. She saw that her child was sick and took him to the doctor, as any loving mother would do. If she really wanted to neglect her son’s medical needs she’d have just stayed home. Fearing the child might have meningitis, the doctor urged Beck to take the child to the hospital. But after they left the office, the child was laughing and playing with siblings. So Beck took her son’s temperature again. It was down to 102. Later that evening it was down to 100. Having shown the judgment to take him to the doctor when the fever was high, it’s not a stretch to think her judgment was reasonable when, the fever having done down, she did not take him to the hospital. When the doctor found out that Beck had not taken the child to the hospital, she called DCS. The DCS worker then contacted Chandler police to go to the home and do a “welfare check” on the child. A caseworker also was on the way to the house. OK, let’s stop again. Why call the police at all? There was nothing to indicate the parents were dangerous or the caseworker’s life would be in danger. Why not just send the caseworker? The police knock on the door. No one answers. A neighbor sees what’s going on and tells the police that Beck “is a good mother.” The police ask her to call the home. Meanwhile, the caseworker has shown up. The father, Brooks Bryce, calls the police back, even as the boy is sleeping in his arms. He declines to let the police in. The father came out of the house with his hands up, as instructed, Ms. Beck came out holding her son in her arms. The son was taken away. So were the other two children. So now we get to the part that’s typical. 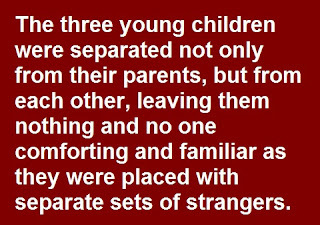 The three children, ages 6,4,and 2, are taken from their parents – and taken from each other - -each placed in a separate home with total strangers. Think of it as the Donald Trump Mexican border approach to child well-being. For at least two-and-a-half weeks two of the children got to visit their parents only once; the toddler didn’t get to see them at all. 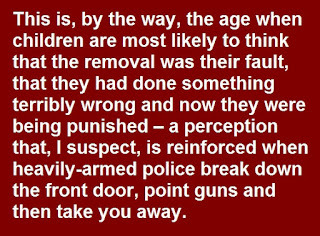 This is, by the way, the age when children are most likely to think that the removal was their fault, that they had done something terribly wrong and now they were being punished – a perception that, I suspect, is reinforced when heavily-armed police break down the front door, point guns and then take you away. None of it was necessary. Even if one assumes there was a need to check on the health of the children, once that was done, and any necessary medical treatment was provided, there was no reason to keep the children away from their parents for another minute. But wait, you say, what if the parents “neglect” their children’s medical needs in the future? Well, first of all, there’s no evidence they neglected the children’s medical needs in the first place. It’s entirely reasonable not to take children to the E.R. if a fever spikes and then goes down again. But even if one thinks what happened on Feb. 25 was neglect, a court simply could have ordered DCS to make random visits to the home (without an accompanying SWAT team) to find out. But here’s the problem: Once an agency such as DCS enters your life it’s the ultimate fishing expedition. If doesn’t matter if the original reason for breaking down the door was absurd. Once in the home, they can put everything the family does under a microscope. And since no family can come out 100% perfect under that kind of scrutiny, they’re bound to find something. 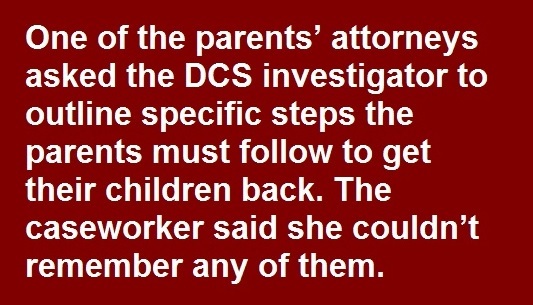 The state's attorney argued that the children shouldn’t be returned to their parents yet because they’d been hostile to DCS workers and weren’t cooperating. I’d be more worried about the parents’ mental health if they weren’t hostile to DCS workers. 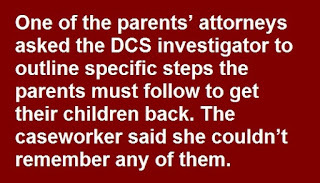 [The lawyer for the state] said the parents had attended a DCS visit with members of [a family advocacy organization, the] Arizona DCS Oversight Group who were combative toward DCS workers. He said the grandfather had tried to videotape a meeting with DCS, and recording is not allowed to protect the privacy of the children. OK, let’s unpack this one. The grandfather did what most people would think they had the right to do - record government officials. And how, exactly is making such an attempt relevant to whether the children would be safe in their own home? But what really has DCS upset, of course, is that the parents spoke publicly about what DCS did to their children. That’s why DCS asked that the court hearings in the case be closed. In most states, they wouldn’t even have to ask. Fortunately, Arizona is different. As the judge in this case, Jennifer Green, put it: “In Arizona, we like our courts to be open.” As for the privacy excuse, the judge did the obvious: prohibited disclosure of information identifying the children, as is routine in states where these hearings are open. Another standard operating procedure: Pile on a cookie-cutter set of conditions parents must meet before their children get to live with them again, conditions unrelated to the actual accusation and usually unrelated to any actual problems the family might have. In this case, the state demanded the parents undergo psychological evaluations – in spite of the fact that neither has a history of mental illness. Why? Because child welfare agencies want to reframe every problem as a mental health problem, and they use the evaluations as fishing expeditions. So they are required in almost every case. In 2017 the Arizona Court of Appeals blasted DCS for how it handles these evaluations. A DCS investigator, a former police officer, took the stand. She said … [the parents] weren’t following steps to regain custody of their children. One of the parents attorneys asked the DCS investigator to outline specific steps the parents must follow to get their children back. The caseworker said she couldn’t remember any of them. There are two dymanics going on here: The routine piling on of irrelevant conditions and a few extra twists of the knife as retribution for the parents talking to media. That, too, is common. Even when there really is domestic violence, removing the children from the non-offending parent is even more traumatic for the child than removing that child in other circumstances. One expert calls it “tantamount to pouring salt into an open wound.” There is what should be an obvious alternative: Remove the abuser. But Arizona, even more than most states, takes an approach to these situations best summed up as “please pass the salt.” The Arizona Court of Appeals had a lot to say about this, too. Sometimes even the calmest of people will do that – even high-ranking news executives such as Dean Baquet, now the Executive Editor of The New York Times. Baquet’s blow to an office wall is well-known, but I’ll bet if he’d had young children at the time, child protective services would never have taken them away. When children can’t stay in their own homes study after study has shown that kinship foster care – placement with a relative – is better for children’s well-being and safer than what should properly be called stranger care. [Judge] Green asked if that check could be expedited. The state's attorney said DCS contracts with a company to conduct safety reviews and has no control over timelines but that it could take up to 30 days. The judge didn’t buy it. She demanded the state get it done in four days – in this one highly-publicized case. 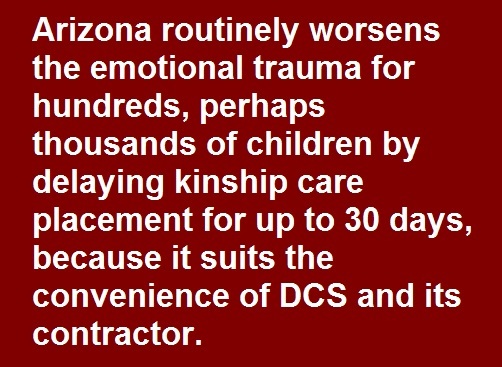 But what this tells us is that Arizona routinely worsens the emotional trauma for hundreds, perhaps thousands of children by delaying kinship care placement for up to 30 days, because it suits the convenience of DCS and its contractor. It is a classic example of a problem Prof. Vivek Sankaran of the University of Michigan Law School wrote about last month: how the system loses sight of the fact that it is dealing with flesh-and-blood human beings, subordinating their needs to bureaucratic convenience. That subordination of these three Arizona children’s needs continues. As noted earlier, the judge also approved the demand for the “psych evals.” But again, because bureaucratic convenience comes first, it takes months to get such an evaluation. That means months before the children are returned to the parents from whom they never should have been taken in the first place. I often point out that all the time, money and effort wasted tearing apart innocent families is, in effect, stolen from finding children in real danger. Workers overloaded with false allegations, trivial cases and cases in which family poverty is confused with neglect have no time to investigate any case carefully – less time to, say, go to the door of a home themselves, knock politely and engage a family instead of immediately calling the cops. 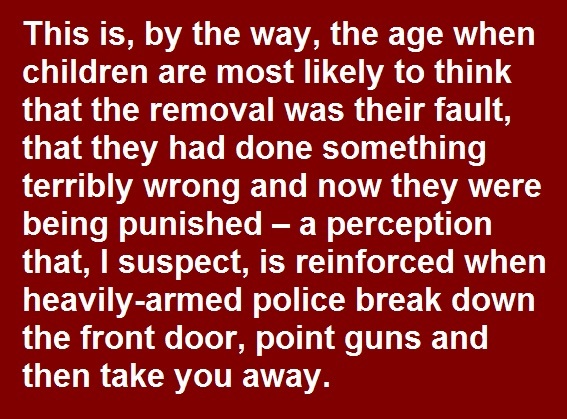 That’s why the SWAT team approach (literally or figuratively) makes all children less safe. But rarely is there so stark an example as in Arizona. Even as the police were sitting in their cars getting ready to break down the door in Chandler, less than 30 miles away, in the City of Maricopa, seven adopted children allegedly were being imprisoned and horribly abused by their adoptive mother, Machelle Hobson – for failing to perform to her satisfaction in YouTube videos. All this helps explain why DCS was so much less interested in the children in Maricopa City than they were in the children in Chandler. When the alleged abuse is in a foster or adoptive home the agency is, in effect, investigating itself, creating an extra incentive to see no evil, hear no evil, speak no evil and write no evil in the case file. No I haven’t forgotten about the vaccines. The toddler in the family from Chandler had not been vaccinated. That may have made the doctor’s original concern more understandable. But that doesn’t change the fact that no one has contradicted the parents’ account that the fever was down well before the police broke down the door. The anti-vaccination movement is pernicious. It is a threat to the health not only to those who are not vaccinated but to children around them, as recent outbreaks of measles make clear. But – unfortunately, in my view -- Arizona has extremely liberal laws allowing parents to leave their children unvaccinated. To the extent, if any, that this was a factor in this case, the solution is to change those laws, not break down the doors of the homes where children have not had vaccines. What are parents who have made the decision not to vaccinate their children likely to conclude from all this? Will they think: Gee, I guess I’d better get my child vaccinated after all? Or will they think: I’d better just hope this fever breaks, because I can’t risk taking my child to the doctor – if I do, they might suffer lifelong trauma at the hands of those charged with protecting them? For that matter, now even some parents who have vaccinated their children may hesitate when their child has a high fever. So congratulations Arizona Department of Child Safety – you screwed this one up in every possible way. Worse, we now know you’re screwing up a whole lot of cases that don’t involve SWAT teams, too.